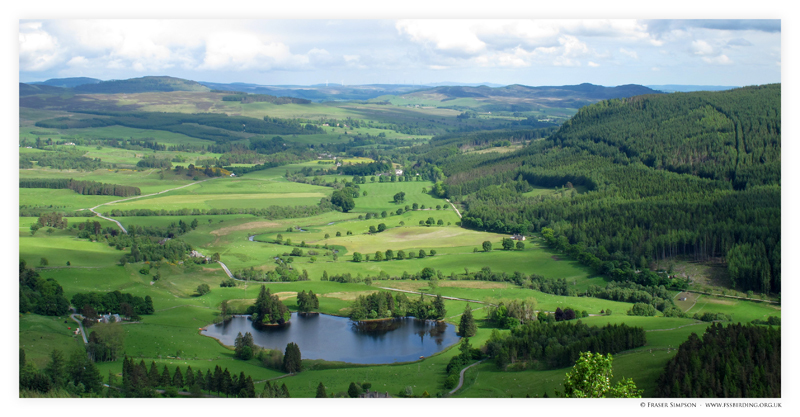 This was my twelfth trip on an undergraduate university field course to the Field Studies Council's Kindrogan Field Centre near Enochdhu in picturesque Strathardle, Perthshire. The field centre is set in an old Victorian estate with a small area of mixed woodland along the banks of the River Ardle at the foot of Kindrogan Hill, largely cloaked in spruce forestry plantation with smaller areas of larch. Strathardle is dominated by pastoral farmland in the glen and moorland on the higher ground. Further to the west lies Glen Brerachan holding some nice heather moorland and small patches of open birch woodland. This trip report details the birds found mainly around the field centre. 2 prs, Straloch Loch, 12/6. 3 ads + juv, small lochan near Tullochcurran, Cateran Trail, 11/6. 1, over Kindrogan House, 7/6. 12, over Kindrogan Field Centre, 7/6. f + b/10, Straloch Loch, 12/6. Pr, over Kindrogan House, 6/6. f, flew downstream along River Ardle at East Lodge, 7/6. Calls from a female in flight, circling potential breeding area. 1 heard, Loch a'Choire, Ben Vrackie, 9/6. f, mobbed by c20 swallows/martins, Enochdhu, 12/6. Male, along forest edge in the clear-fell, above the cemetery in Kindrogan Hill, 7/6. Calling from 04:03h on 9/6. 1, with pale tail base, East Lodge, 7/6. Adult, mobbed by two Ravens, Ben Vrackie, 9/6. Pr + 2 juvs, Straloch, 9/6. 1, lower slopes of Ben Vrackie, 7/6. Calling from 04:03h on 9/6, 03:57h on 11/6. 3 territorial prs, Cateran Trail between Enochdhu and Kirkmichael, 11/6. 2 territorial prs, Ceanghline-Dalnacarn, Glen Brerachan, 04:28h, 12/6. Roding, from 21:55 along the main drive at field centre, 10/6. 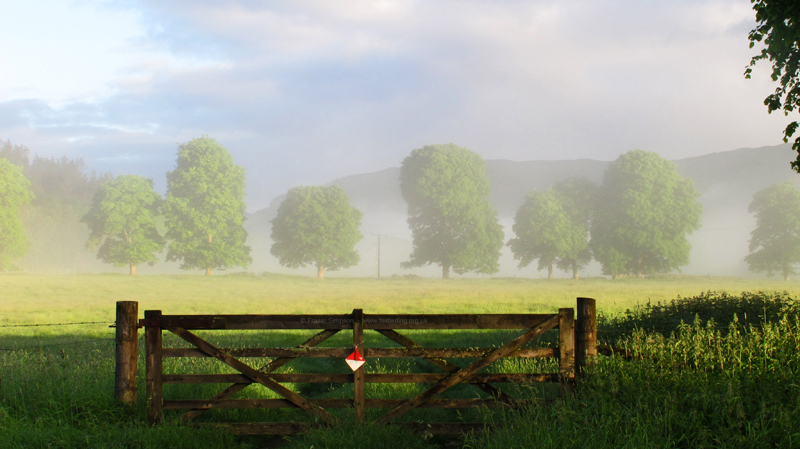 3 displaying mm, Ceanghline-Dalnacarn, Glen Brerachan, 04:28h, 12/6. Bubbling song uttered during display flight over heather moorland, with two birds from 20 secs. Pr, aggitated (chicks nearby? ), old bridge at Enochdhu/River Ardle, 11/6. Pr, Brerachan Water, Glen Brerachan, 12/6. 1, Kindrogan Field Centre, 8/6. Singing from 03:59h on 9/6, 03:50h on 9/6, 04:10h on 11/6. Singing m, daily around field centre/cemetery; singing from 05:15h on 11/6. Singing m, Moulin trail to Ben Vrackie, 9/6. f, calling at the entrance to Kindgrogan Field Centre, 21:25h, 8/6. 2, over Kindrogan House at 15:41h, 7/6. Pr, daily between Kindrogan House and the clearfell around the cemetery. Yaffling male (second territory? ), Enochdhu, 11/6. Feeding young in larch tree hole, Balnald, 10/6. Calling from 04:29h on 9/6. 2 singing mm, Glen Brerachan, 12/6. 2, West Lodge, Brerachan Water, 12/6. 6 AON, The Steading/Coppock Building. Melanistic adult present all week. 3 AON, Kindrogan House, two at the rear, one at the front. 1 displaying m, curling pond, 7/6. 4 singing mm, clear-fell around cemetery on north-east side of Kindrogan Hill (NO 055625), 11/6. 1 displaying m, West Lodge, 03:58h, 12/6. Perched song composed of a series of slow trills, the main phrase gradually decreasing in frequency. Singing from a regenerating clear-fell area of Sitka Spruce on Kindrogan Hill. Flight song during parachuting display composed of a more complicated series of slow and rapid trills and more musical slurred elements delivered in discrete phrases. 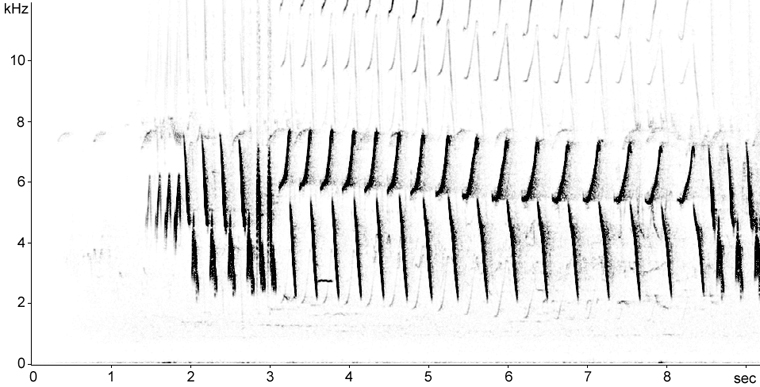 Noted distinctive downslurred element from 8.1 to 5.7 kHz between 77.1 and 77.9 secs. 2-3 prs, around trig point on Kindrogan Hill (NO 047627), 7/6. Many displaying, Glen Brerachan, 04:08h, 12/6. Female, Kindrogan Bridge, River Ardle, Enochdhu, 7/6. 1, Tarvie Burn mouth, Glen Brerachan, 12/6. Abundant, east end of Glen Brerachan, 6/6. Pr, nesting in the Steading, Kindrogan Field Centre. Several pairs, with food for young, Glen Brerachan, 12/6. Pr, River Ardle at Kirkmichael, 11/6. 1, confluence of Tarvie Burn/Glen Brerachan, 12/6. Fairly common, e.g. 6 singing mm between field centre and West Lodge. Singing from 03:28h on 9/6, 03:27h on 10/6, 03:38h on 11/6. 2 singing mm, between 650-750m on Ben Vrackie, 9/6. 2 singing mm, near cemetery, 8/6. 4 singing mm, Cateran Trail between Enochdhu and Kirkmichael, 11/6. Singing from 03:11h on 9/6, 03:14h on 10/6, 03:09h on 11/6. Singing m, birch wood at east end of Glen Brerachan (NO 030637), 12/6. Singing m, west of war memorial, Glen Brerachan, 12/6. Singing m, on triangular rock on skyline at 650m on Ben Vrackie, 9/6. Independent fledgling, curling pond, 10/6. Singing from 03:26h on 9/6, 03:27h on 10/6, 03:23h on 11/6. Singing from 03:16h on 9/6, 03:16h on 10/6, 03:11h on 11/6. 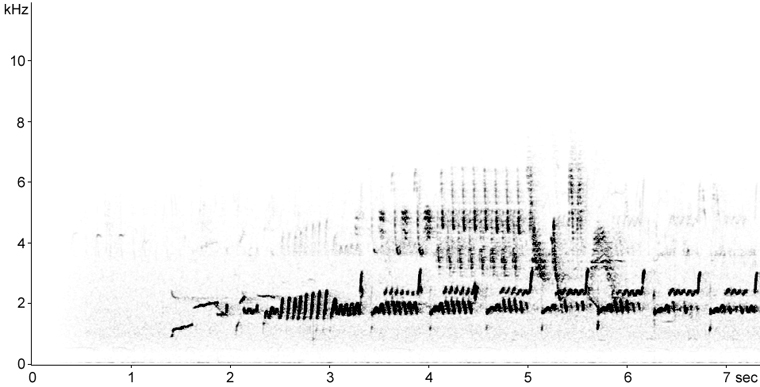 One heard mimicking female Cuckoo's bubbling call from 03:20h on 9/6. 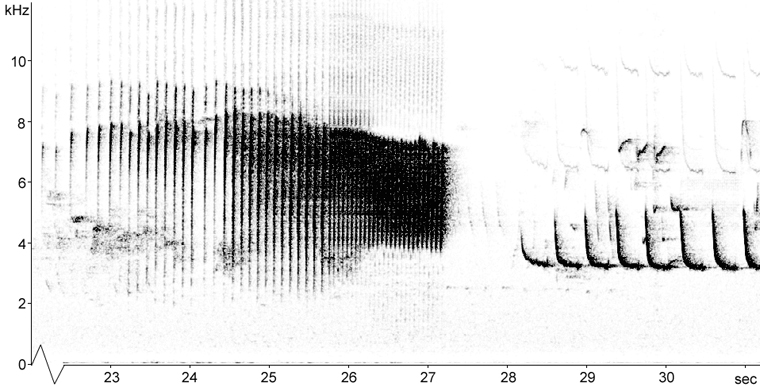 The same individual was mimicking a Woodcock's "ogg-ogg-ogg" and Oystercatcher calls, 21:05-22:05h, 11/6. Singing m, Balnald, 03:49, 12/6. Singing m, Cateran Trail near Kirkmichael, 11/6. Singing from 03:50h on 10/6. Singing from 03:38h on 10/6. Unpaired singing male in tree-fall area in mossy spruce plantation (with sycamore/beech edge) near Balnald 10-12/6. 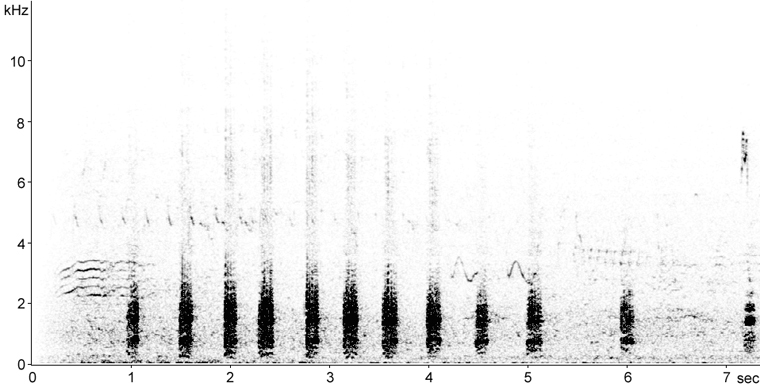 Song composition: 84% trills, 16% tew-tew-tew (100 strophes in total in 27.5 mins during light rain). Singing male on the trail from Moulin to start of Ben Vrackie trail, 9/6. Singing m, in large beach on woodland edge near the cemetery, Kindrogan Hill, 11/6. 11 singing mm, between field centre at West Lodge, 10/6. Singing from 03:57 on 11/6. Singing from 03:38h on 9/6, 03:35h on 10/6, 03:29h on 11/6. 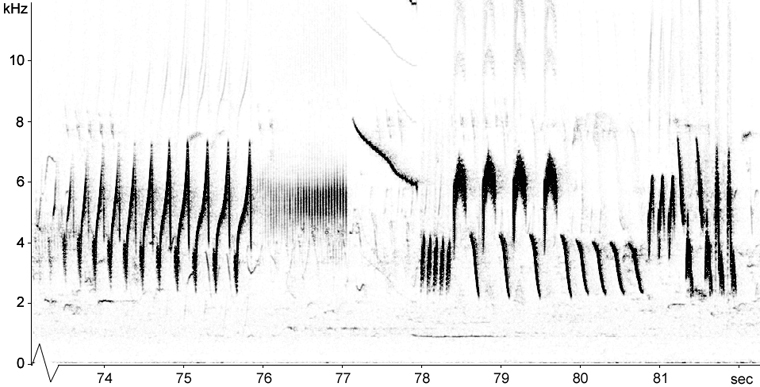 Singing mm or pairs noted at: track between field centre and curling pond, birches at curling pond, Davan, West Lodge. Singing male, from car park oaks from 07:25h on 7/6. Had bred this season according to MJ. Singing from 03:53h on 10/6, 04:11h on 11/6. Singing from 03:49h on 9/6, 04:10h on 11/6. Singing from 04:22h on 9/6. 1, calling near cemetery, 7/6. At least 10 prs nesting in chimneys of Kindrogan House and in natural holes and nest-boxes in the adjacent beech wood. Many recently fledged broods in Glen Brerachan. Advertising call from 04:11h on 10/6, 03:57h on 11/6, 03:43h on 12/6. 2, lower slopes of Ben Vrackie, 9/6. Pr + b/3, peak of Ben Vrackie, 9/6. Abundant. Most pairs feeding young in the nest. Singing from 04:14h on 9/6, 04:03h on 10/6, 04:08h on 11/6. f, fairly tame/begging for food around the trig point on Kindrogan Hill had obviously become used to picnicing group, 7/6. Singing male, The Steading, 9/6. 2, singing mm, in car park oaks, 8/6. Displaying birds noted in most areas. 8 registrations, Glen Brerachan, 12/6. Heard, at the curling pond, 7/6. 2 prs, daily, feeding on elm seeds on slope opposite field centre entrance. Pr, on track between East Lodge and Kindrogan House, 7/6. 1 singing male, Glen Brerachan, 12/6.